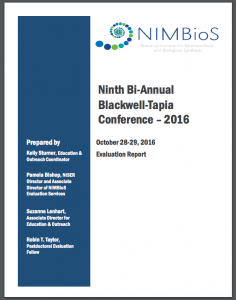 The final report of the ninth annual Blackwell-Tapia Conference and Award Ceremony, held Oct. 28-29, is out and feedback from the participant feedback shows that by all measures the conference was a success. NIMBioS was the lead organizing institute, along with the Statistical and Applied Mathematical Sciences Institute (SAMSI) as co-organizing institute. The NSF Mathematical Sciences Institutes Diversity Committee hosted the event, which was held at NIMBioS and at the University of Tennessee Conference Center. The conference was sponsored in part by the Alfred P. Sloan Foundation. According to the final evaluation report, the grant’s goal to support the conference in providing early-career minority mathematicians with enhanced understanding of their field, networking with peers, and interactions with senior researchers was achieved. More than 100 participants attended the conference. Most participants represented a variety of researchers across different career stages with the majority of participants at early career stages. According to the evaluation report, 100% of survey respondents found the overall quality of the conference, banquet, award presentation, and networking opportunities to be good or better. 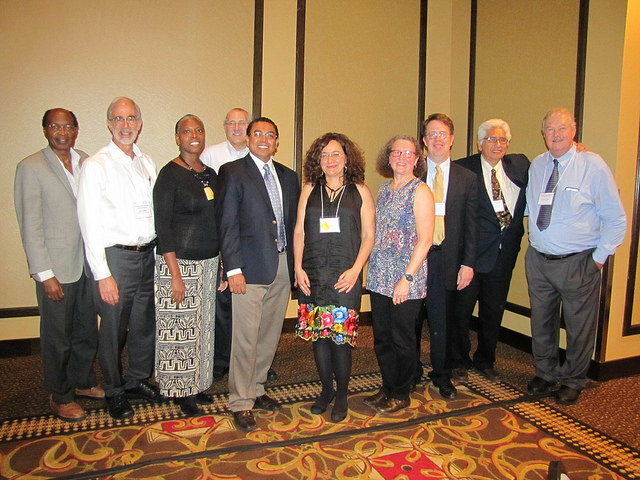 The bi-annual conference was established in 2000, honoring David Blackwell and Richard Tapia for their inspiration of AfricanAmerican, Native American, and Latino/Latina students to pursue careers in mathematics. This year’s prize was awarded to Dr. Mariel Vazquez, a mathematics professor at the University of California, Davis. The final evaluation report, which summarizes the conference’s success in relation to associated metrics provided by the Alfred P. Sloan Foundation, includes participant survey results, participant demographic information, a report assessing long-term effects of the conference, and much more. Links to videos of the conference presentations, blog posts about the conference, and other conference details can be found on the conference web page. The conference photo album can be found on the NIMBioS Flickr page. This entry was posted in awards, conference, Diversity, evaluation, gender diversity and tagged awards, conferences, diversity. Bookmark the permalink.